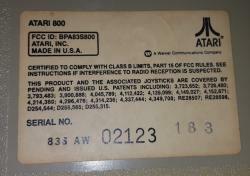 Post your 800's serial numbers here. Don't forget the 3-digit date code! It's ink-stamped on the label or gold-stamped on the case bottom. See discussion in the 400 thread. AW 327741 ??? tschak909 ??/?? AW 347179 ??? adam242 ??/?? AW 356203 ??? adam242 ??/?? Edited by ClausB, Tue Mar 5, 2019 7:51 PM. 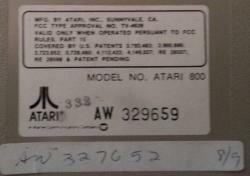 Third one is missing the sticker entirely, but it has 48K and GTIA, so can't be that old. 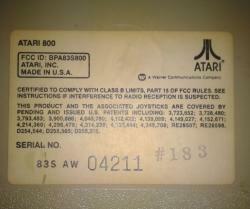 So '081' stamped doesn't mean 8th week 1981.
or 081 means the case was made 8th week 1981? Edited by russg, Mon Aug 31, 2015 3:35 AM. NTSC 800 with GTIA. This is my 800 with Incognito. This is also an NTSC unit which is currently not working. 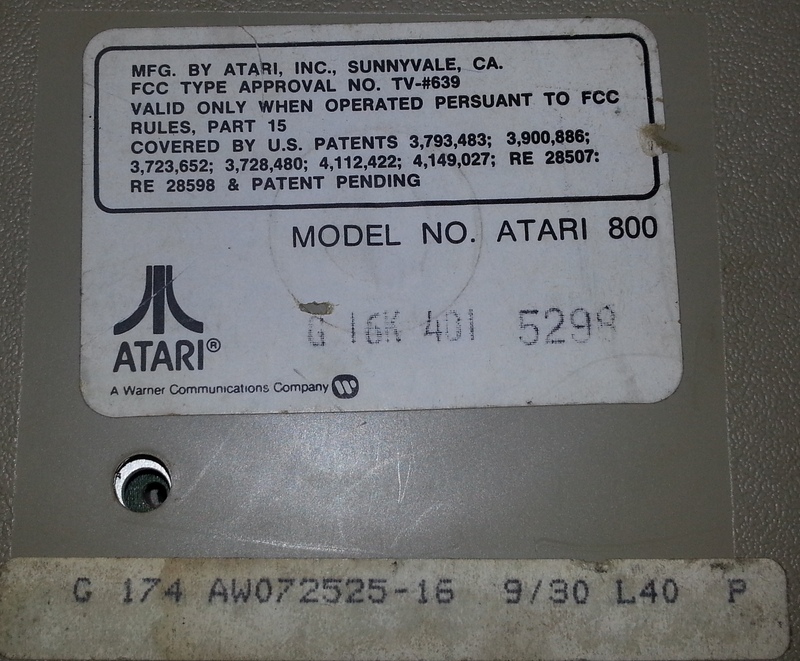 It has a weird stamp in the bottom of the case and is sadly also a GTIA. I'm rather astounded that no such thread existed before now. Well done, Claus. I have two currently. 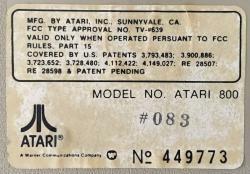 The first looks to have been built in August 1982, per both the "332" week/month inkstamp on the main serial number label, as well as the "8/13" date on the handwritten second serial number label. August 13 is a pretty good correlation with the 33rd week of 1982. This machine still has thumb tabs rather than screws for the slot cover, although the ram is uncased. 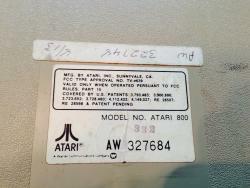 Speaking of which, this machine has one stock Atari 16K board in slot 1, and a vintage third-party 32K board in slot 2. Thus I suspect this was built as a 16K machine but later upgraded by its owner early in life. 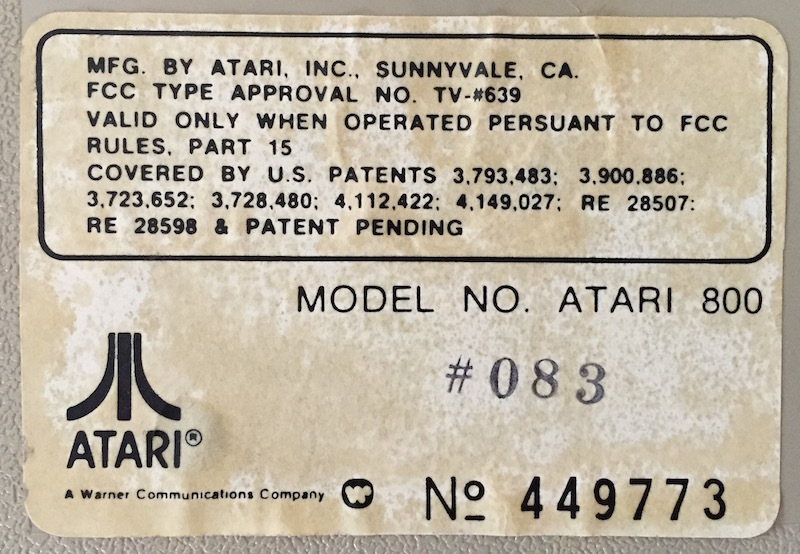 My second is a "late model" 800 from May 1983, per the three digit inkstamp on the large main label, as well as the "5-5" date on the handwritten secondary label. Again, May 5 matches up pretty well with week 18 of 1983. 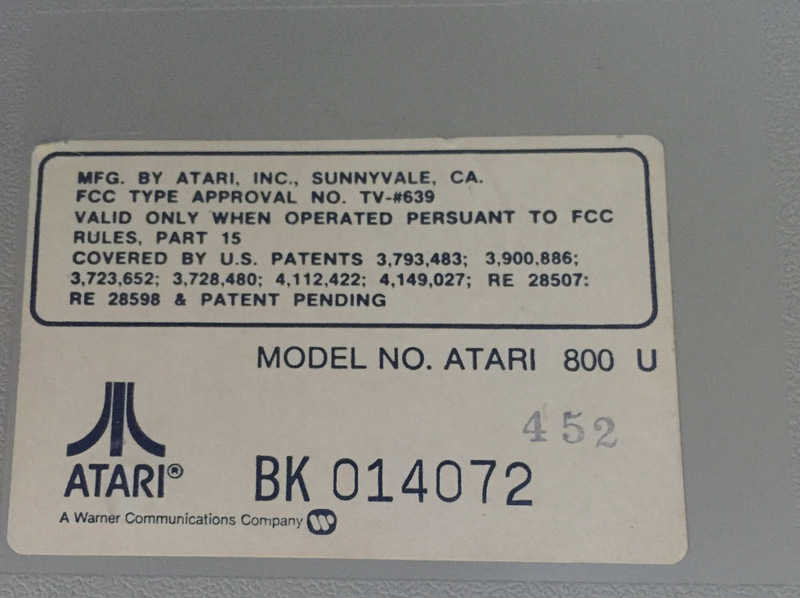 This machine is boxed and was 48K straight from the factory as you would expect from the manufacturing date (and from the large "48K" sticker on the box ) - the slot cover is screwed down and there are the expected 3 standard Atari 16K boards. Interestingly, in both cases the number on the handwritten label does not match the number on the large main label. 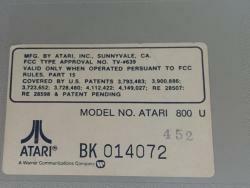 Also, looking at these two, it is apparent that Atari changed their numbering scheme for the large labels somewhere along the way. 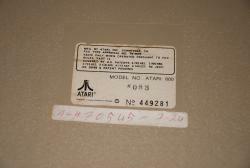 The handwritten labels look similar to the labels that are attached to the boards inside the computer. 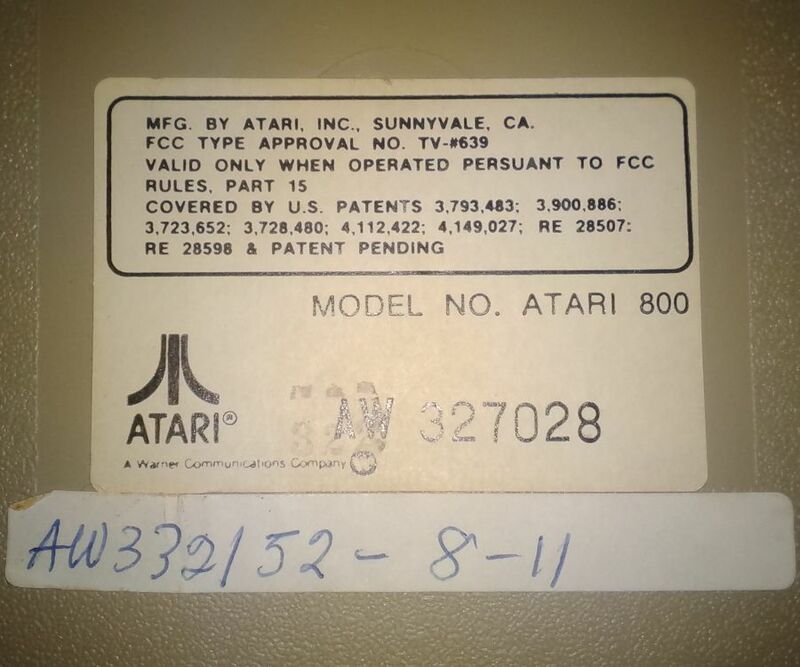 Is it possible this label is a copy of the label on the main board? 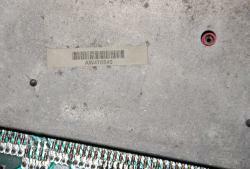 Or it could just serve the same purpose as the labels on the internal boards, whatever that might be. I don't think there are labels on the boards inside either of mine. I'll have to review all my photos tonight when I get home from work to be sure. 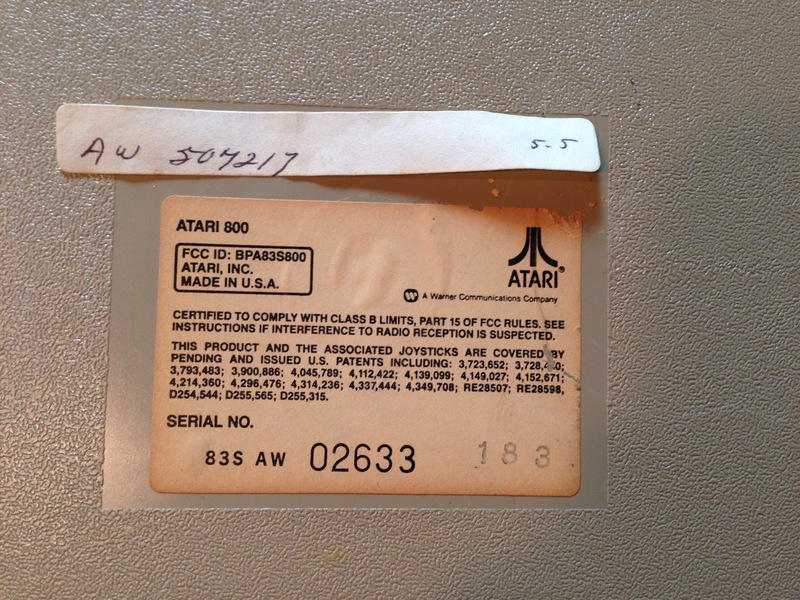 One of my 400's has a secondary label like this on the bottom as well, without any internal labels that I recall. I posted this pic of my 810 side board a while back that shows the tag on it. Not exactly the same but it has a similar code with 2 alpha and 6 numeric characters. I'm pretty sure I've seen these inside my 400 as well. I'll have to take a look later. This guy has disassembled/photographed a TON of hardware. This 400 has the labels on every board but none start with AW. Of course it's missing from the bottom of the case. I would still like to know the purpose of that sticker since it doesn't seem to match the S/N on the label. 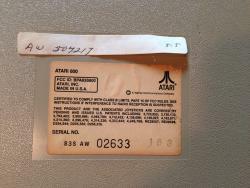 Were's an ex-Atari employee when you need one? Here we go. 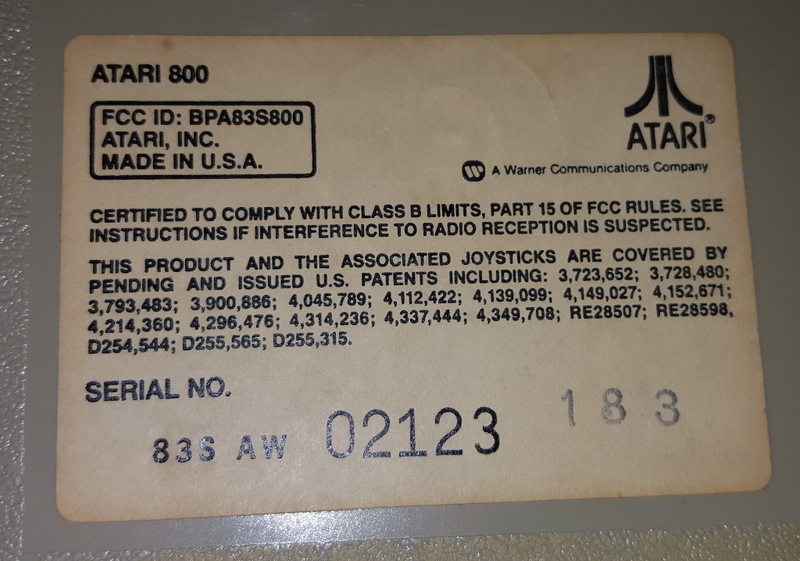 It's not very clear, but I'm pretty sure the sticker on the bottom of this 800's case matches the code on the sticker attached to the top of the RF shield. Edited by spookt, Tue Sep 1, 2015 11:34 AM. Now this I can confirm for at least one or two of my machines. I'll have to get home from work for photos but I've noticed this before. I don't think there are labels on the boards inside either of mine. I'll have to review all my photos tonight when I get home from work to be sure. 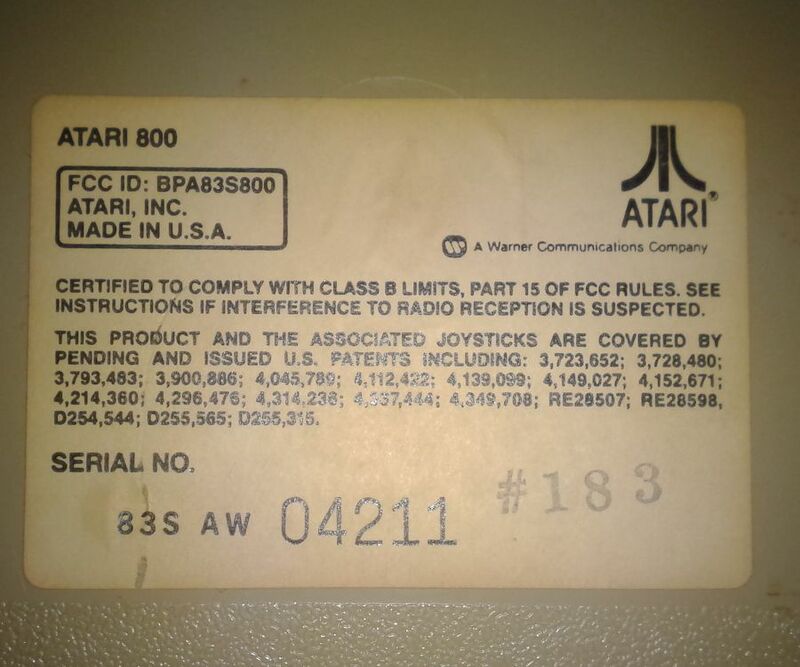 Okay, I've reviewed the disassembly photos of my machines tonight and I stand corrected - most of the boards inside my 400/800 machines do indeed have stickers, but not all of them. All four were made from mid-'82 to around May '83, so I think it's likely they all started life with stickers like that but some of them have gotten lost. 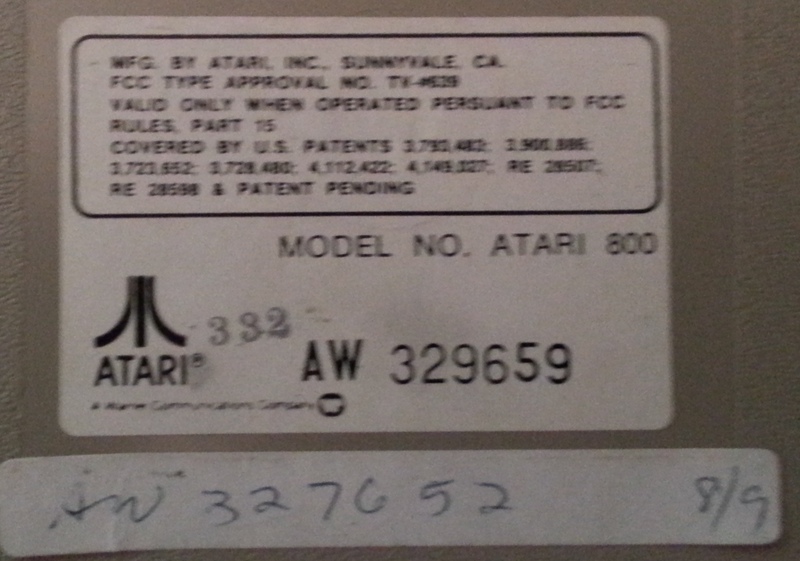 For instance, in my later 800 (the one with 3 stock 16K boards) two of the RAM boards have stickers but one does not. To address the question I've bolded above, one of my 400's has a sticker on the main board but the other does not. 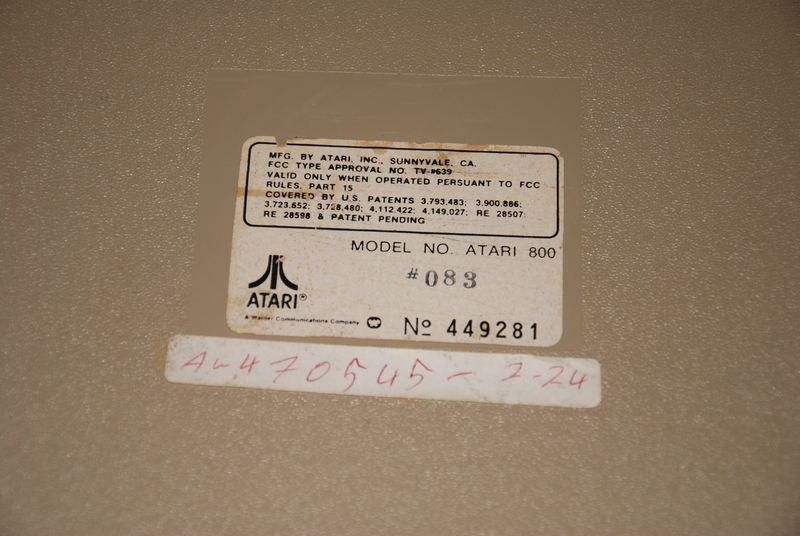 However, on the one with such a sticker, the number there does not match the handwritten label on the case. Edited by DrVenkman, Tue Sep 1, 2015 6:07 PM. Here are the numbers for my 800. The AW number matches the label on the RF shield. Does the third one have an embossed stamping at the back of the case bottom? My third one also lacks a sticker but the stamping shows the numbers. Just a suggestion, Claus - PM Albert or another Moderator and ask for permission to edit the first post of this thread so you can keep the up-to-date list there where it's easy to find. I think they can rescind the time limit for you to do that. Here is mine. Had to dig it out of storage. The bottom shell doesn't match the innards. 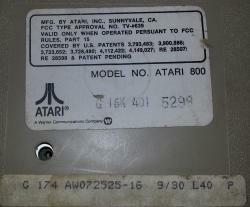 In the late 80's I replaced the bottom due to a crack/chip. Edited by Ripdubski, Mon Sep 7, 2015 8:12 PM. Related : I have a 400 with #331 that came from Alamogordo, NM. I am new here, but I can contribute my serial plate! The handwritten sticker fell off a long time ago.... From what I have learned here, it appears my 800 is a later model. 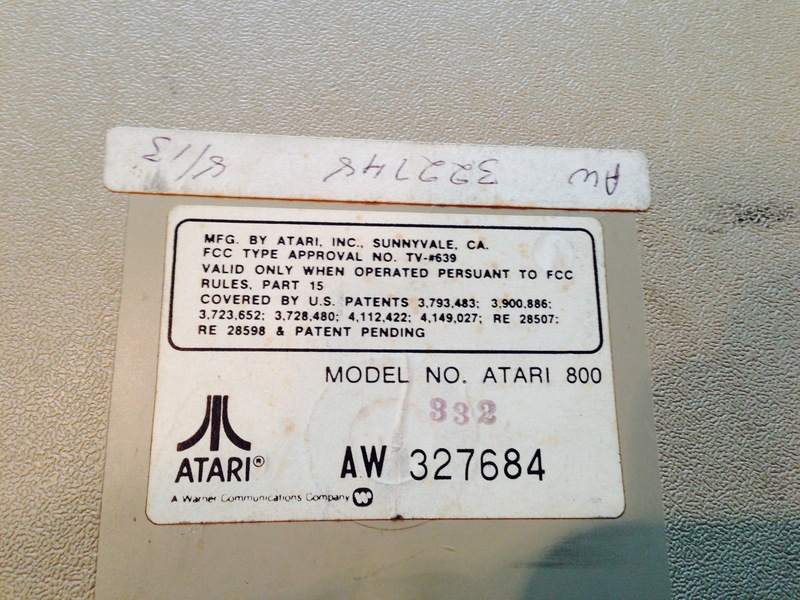 I recently retrieved it from storage because my oldest son (10yo) has become interested in retro-gaming. From lurking on this board and reading 800 technical documents, I have learned that it is very similar the 68HC11 I used in college and in my early professional life - I learned machine language coding on it in school and did a lot of robotics work and control systems work using the HC11. I even wrote an Ada compiler that targeted the HC11. Of course, this was all some time ago ('93 to '99) But, I only have a single 800 at the moment, and I am a bit apprehensive to hack on it. I did build the SIO2PC - out of necessity as my 1050 drive died shortly after getting it out of storage along with the 800. I even pulled out my HP1651A and my (broken screen) TDS2012 in anticipation of some kind of HW work The HP still works, but the screen takes about 10min to warm up.... my first project seems to be to try and get the 1050 operational again.